You may be a lost man in a lost world. You may lose your faith in the people on TV and your belief in your politicians. But if you ever lose your faith in Sting, there may be nothing left for you to do. While that last bit might sound a tad much, it perfectly summed up the atmosphere at Mata Elang International Stadium in Ancol, North Jakarta, where English rock legend Sting rocked the stage and mesmerized thousands of fans with 22 songs on Saturday night. The night’s repertoire did not consist merely of his own hit singles but also several tracks from his years as the front man of The Police. While his hair may be graying and his face may be showing signs of aging, one thing is for sure: Sting’s voice is still as heavenly as ever. However, despite fans showering the show with praise, some were left dissatisfied when Sting did not fulfill their request to sing his 1987 single 'They Dance Alone' and dedicate it to murdered human rights defender Munir Said Thalib. The show itself began at 8:45 p.m. after almost a one-hour delay from its scheduled start. Sting finally graced the stage and, just like that, the crowd went wild. Hands were clapping all throughout the stadium as the audience shouted their hearts out in euphoric joy, welcoming the rock star to the stage for the second time in Indonesia, after his Ten Summoner’s Tales tour in 1994. As his five-piece band revved things up, Sting picked up his guitar, walked up to the microphone and greeted his Indonesian fans. "Selamat malam [Good evening], Jakarta!" he shouted, which drove the crowd into overwhelming rapture. The night was off to a great start with Sting belting out his 1993 single 'If I Ever Lose My Faith in You' followed by The Police’s 1981 hit 'Every Little Thing She Does is Magic'. He shouted "Terima kasih! [Thank you!]" to the audience after he finished and said that he was glad to be back in Jakarta. “It’s good to be back here. It’s been 18 years. I think I was just 10 when I visited here last time,” said the 61-year-old singer, who was born Gordon Matthew Thomas Sumner in Wallsend, England, on Oct. 2, 1951. The audience then formed a massive choir once the first few notes were played on the third song, 1987’s 'Englishman in New York'. Even before he started singing, the crowd was already singing the famous chorus. "I’m an alien, I’m a legal alien. I’m an Englishman in New York." Witnessing that, Sting temporarily stopped plucking his guitar and just stood there on the stage with his jaw resting on one hand, as if he was amazed by the overwhelming response. He even clapped his hands as a small token of appreciation for his loyal fans. The massive choir was heard a few more times throughout the two-hour concert, particularly on perennial fan favorites 'Roxanne' and 'Every Breath You Take'. Other songs in the night’s repertoire included 'Seven Days', 'Fields of Gold', 'Message in a Bottle', 'The Hounds of Winter', 'Desert Rose' and 'Fragile', which served as the grand finale in the show’s third and last encore. 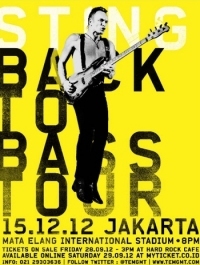 The show was the last stop on his "Back to Bass" global tour, which started in October 2011, storming stages across the world. In the concert, Sting was accompanied by three of his long-time collaborators: drummer Vinnie Colaiuta (who, according to Sting, is "the best drummer in the world"), keyboardist David Sancious and guitarist Dominic Miller, as well as backing singer Jo Lawry and violinist Peter Tickell. Among the thousands of audience members were Jakarta Governor Joko Widodo, prominent human rights activist Usman Hamid, singer Oppie Andaresta and business tycoon Setiawan Djodi. "I’ve wanted to watch Sting for a long time. He is truly a singer with extraordinary talents. He can sing on a high octave and yet he still sounds great," Djodi said, as quoted by Antara news agency. He added that he was most impressed with Sting’s performance of 'Desert Rose'. While many local fans had a great time during the show, it was a bittersweet event for some, as Sting did not perform his song 'They Dance Alone' and dedicate it to the memory of murdered human rights defender Munir. Earlier this month, several local Sting fans started online campaigns via Twitter and petition website change.org to send a message to Sting to dedicate 'They Dance Alone' to Munir. Fans signed an online petition on website page www.change.org/StingMunir and messaged Sting on his official Twitter account @officialSting, particularly on Dec. 8, the date Munir was born in Malang, East Java, in 1965. More than 1,300 people have signed the petition. Sting was an active member of Amnesty International and was globally renowned for his human rights campaigns. Last month, he switched concert venues in Manila after he was petitioned by an environmental group. It turned out that the venue’s owner is a business tycoon with a record of destroying green areas to develop malls and parking lots. During the Jakarta concert, there were even several fans who wore jackets emblazoned with the words "They Dance Alone for Munir". Sadly, though, their wish did not come true. "I have to admit I was a little bit saddened," Usman told The Jakarta Post after the show. "Each time Sting took a bow and left the stage, I kept hoping that he would come back just one more time and sing 'They Dance Alone' for Indonesia," he said. "Even after his final song, 'Fragile', I was still hoping that he would come back out and just surprise us with that song. Oh well, I guess it was not meant to be." "But the concert was still cool. Sting is awesome, as always," he added. I was there, and enjoyed the concert so much! Hope to see you closer on your next tour in Jakarta..:D Thank you!! *By the way, why didn't you sing When We Dance? Sting concert is awesome. I always love Sting.